The Green Bay Packers have won only one game, a 1-4-1 record, since quarterback Aaron Rodgers fractured his collarbone. Rodgers is hoping to play in Sunday's game against the Dallas Cowboys. Prior to Nov. 4, the Packers had a one-game lead over the Chicago Bears in the NFC North Division. That changed on Nov. 4 when the Bears defeated the Packers 27-20. 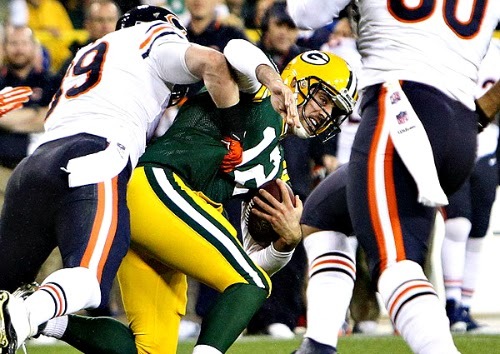 The game is not memorable for the Bears' winning, but for Rodgers sustaining an injury. During the Packers' first drive of the game, Bears' defensive end caught a scrambling Rodgers from behind and tackled him. The tackle caused Rodgers to land hard on his left shoulder, which led to him fracturing his collarbone. The Packers have tried to use three different options at quarterback, but none of them are on the same level as Rodgers. Rodgers had thrown for 2,218 passing yards, 15 touchdowns and only three interceptions in eight games and half of a drive. The offense scored 212 points during that stretch, which is an average of 26.5 points per game. The offense under Seneca Wallace, Scott Tolzien and Matt Flynn has been much worse. The three of them have combined to throw for 1,446 passing yards, only three touchdowns and seven interceptions and throw for 1,446 passing yards through nearly six games. The offense has scored 104 points since Rodgers' fractured his collarbone, which is an average of 17.3 points per game. The most embarrassing offensive performance during this stretch was their Thanksgiving game against the Detroit Lions. The Packers scored 10 points that game and they looked abysmal. This has led to the Packers going from first place to third place in the NFC North; they currently have a 6-6-1 record. The division leading Lions and the second-place Bears only have one more win than the Packers, a 7-6 record. If the Lions or Bears take the division, then the Packers would most likely miss the playoffs. The NFC Wild Card leaders, the Carolina Panthers and the San Francisco 49ers, both have a 9-4 record. The Packers would need a miracle to surpass one of those two teams to make the playoffs. Rodgers is hoping to return on Sunday, according to Packers.com. He has taken some snaps with the first-team offense, which is a great sign. However, he has not been medically cleared yet, according to rotoworld.com. Bears' quarterback Josh McCown threw for 348 passing yards and four touchdowns in their Monday night victory against the Cowboys. Rodgers is so talented that he could easily put up those statistics. ESPN NFL analyst Adam Schefter said that Rodgers will undergo a Friday morning scan. If Rodgers can be medically cleared to play on Sunday, then the Packers still have a shot of winning the NFC North.